Software Defined Overlay Networking provider TELoIP(tm) Inc. has further expanded its intellectual property portfolio with the grant of a new United States patent for a method and technology that enable superior functionality in the company's SD-WAN and SD-Internet(tm) solutions. The patent covers TELoIP's unique approach for providing "improved performance of aggregated/bonded network connections between remote sites." This innovation is enabling its SD-WAN resellers to combine the bandwidth of multiple connections from diverse ISPs in a unique way that improves speed, performance and reliability for customers with locations distributed throughout North America. TELoIP uses a proprietary, patent-protected technique referred to as Proximal Aggregation to provide a substantial performance boost for cloud-managed service providers and customers who run applications at a distance over aggregated connections. TELoIP's patented technology leverages the company's multiple points-of-presence, collectively known commercially as the TELoIP Cloud, to overcome the distance-related degradation problem of other link aggregation solutions. "The advantage of our Proximal Aggregation approach was immediately clear from our very first test," said Pat Saavedra, Founder and CTO of TELoIP. "Network performance is a factor of bandwidth and time, and with long-haul aggregated connections or DMVPN type overlays, time is not on your side." 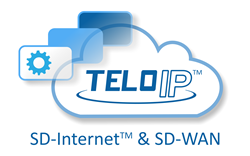 Proximal Aggregation technology is embedded in the TELoIP Cloud and is included as a standard feature of TELoIP's SD-Internet and SD-WAN solutions. "The SD-WAN market hit near $40M globally for 2015, and we forecast $1.3B in revenue by 2020. There have been successful large scale SD-WAN deployments in 2015, and solutions have matured to allow the technology to pass from the hands of early adopters to mainstream enterprises," said Cliff Grossner, Ph.D., IHS senior research director for data center, cloud and SDN. "TELoIP's performance enhancing aggregation technology applied to SD-WAN allows it to enable its go to market partners with a very competitive solution targeting a high growth market." As companies depend increasingly on cloud-based software-as-a-service for crucial business applications, their needs for network optimization have expanded beyond their private wide-area networks to include critical Internet traffic. The TELoIP Cloud provides a virtual network overlay that extends software-defined network optimization beyond SD-WAN to enhance the customer experience for Internet services and public cloud applications. This allows TELoIP resellers to offer two tiers of software-defined solutions, VINO(tm) Internet and VINO WAN, that run through the same turnkey cloud overlay platform. The TELoIP Cloud combines Proximal Aggregation with other unique, patent-pending features that create significant value for geographically-dispersed enterprises and providers of cloud-based services who address a nationwide customer base. TELoIP software defined overlay networking solutions featuring Proximal Aggregation are available to customers across North America through TELoIP certified partners. Customers can contact TELoIP directly to find a participating partner by emailing sales(at)teloip(dot)com or calling 1-866-901-3268. For more information about TELoIP's patent portfolio, please visit http://www.teloip.com/patents. About TELoIP - TELoIP develops market-leading Software Defined Overlay Networking innovations that dramatically increase the performance, agility and efficiency of business networks. TELoIP's SD-WAN and SD-Internet solutions combine multiple patented technologies into a turnkey, cloud-managed Virtual Intelligent Network Overlay (VINO), empowering customers with unparalleled network visibility, control and confidence while simplifying management and lowering their costs. Founded in 2002, TELoIP is headquartered in Toronto, Canada. For more information, visit http://www.teloip.com.